Andy Gallik will make his first NFL start Sunday against Atlanta. 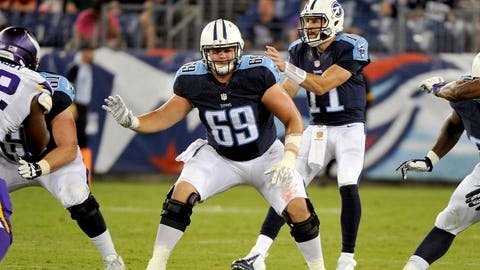 The season-ending injury suffered by Tennessee Titans center Brian Shwenke in last Sunday’s loss to the Miami Dolphins will force the team to start two rookies along the offensive line this week against the Atlanta Falcons. Andy Gallik, a sixth-round pick out of Boston College, will make his first NFL start against the Falcons. Gallik took over for Schwenke after the veteran dislocated his left ankle in the second-quarter against the Dolphins. Gallik will join fellow rookie Jeremiah Poutasi in the starting lineup. Poutasi was benched after giving up three sacks against Miami, but Whisenhunt said Monday he would remain the starter at right tackle.